Feeling pressure to automate your IT processes? As businesses demand to work faster, organizations across the board are feeling automation pressure right along with you. Operations like monitoring, log processing, and notifications are perfect candidates for automation, but full automation is not always in your best interest. Running triage and escalating incidents work better when they’re efficiently curated, to enable your staff to make informed decisions. Operationalize steps for collaboration and resolution. Integrating systems, mitigating vulnerabilities, and the potentially catastrophic consequences of mistakes are three surprising dangers of automation. Keep these in mind during your digital transformation. When processes involve more teams and systems, decisions about next steps can have enormous ramifications. Bad choices from one department could create a domino effect that leads to lost revenue, decreased productivity, and other significant problems. Automated processes help you narrow your focus onto relevant, actionable data. It arms you with the information you need to make good decisions, but don’t let it take over this entire process. Considering all the variables going into each choice can be dicey, and human interaction is still necessary to determine which options work the best. Think of automation as a way of augmenting your decision-making process, rather than a way to eliminate it entirely. A human gate is often a necessary part of leveraging your system integrations appropriately. Look at critical notifications and data to determine whether you need to act on this information immediately, how it should be prioritized, and the best people to resolve this issue. Any process that gets automated should serve to make it easier for a technician to restore the enterprise’s systems to functionality, not to create its own set of issues that need to be compensated for. In other words, automation is a means to a greater end, not an end unto itself. In a major incident, every hour of downtime can cost $300,000 or more. Teams tend to slam on the brakes of their business operations when critical systems go down or databases become inaccessible. You need to resolve the issue quickly, but hasty mistakes can make matters much worse. Your team must have a comprehensive approach that considers all of the potential causes and fixes, along with the way they interact with other systems. Automation can help you eliminate the low-hanging fruit when you’re troubleshooting, as well as supporting your disaster-recovery efforts. However, your staff needs to leverage their skills and knowledge to ensure that they can get the system back up and keep it up. An automated system may not know that your top specialist in a particular system is out sick and unavailable, even if she’s listed on-call. Some team members may have an excellent skill set for resolving that type of incident even if it doesn’t technically fall in their wheelhouse. An automated system works best as a way to quickly notify the typical chain of command and alert on-call technicians when there’s a problem, along with providing suggestions for alternatives if these team members aren’t available. But people can make the final decision on the best people to contact and whether to bring in emergency resources during the disaster. Combining sensitive information with autopilot processes can be dangerous. New regulations, such as GDPR (coming in May 2018), could cost organizations big time with this type of solution. When a fully automated system doesn’t have these safeguards in place and treats sensitive information the same as any other data, your organization could be subject to fines and legal action. You need a way to keep this information safe and allow human staff to work with the process in order to proactively get ahead of potential issues. Data breaches and misused personal data is a growing problem among all organizations, and completely automating these processes makes it difficult to intervene when necessary. Focus on your security by automating the right things, rather than everything you can. Automation is absolutely necessary to separate signals from the noise among the high volume of alerts, but people still need to make the call on what’s an incident that requires action. 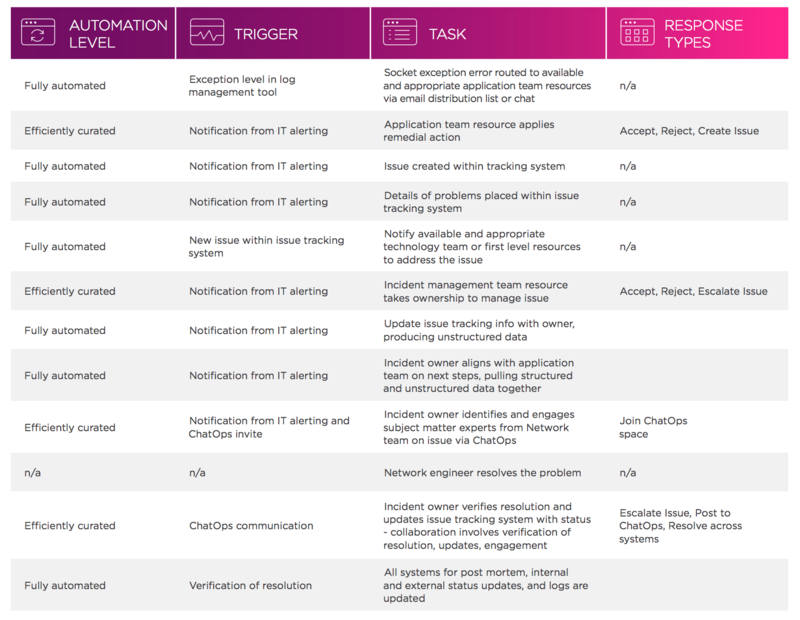 As events unfold during a service outage or deployment, the handoff from tool-to-tool and ill-defined communication processes slow organizations down. The xMatters collaboration platform relays data between systems and across entire toolchains while engaging the right people to resolve incidents. Our solution ensures that the correct individuals and groups for any situation get identified and notified of what’s going on so they can take quick action. 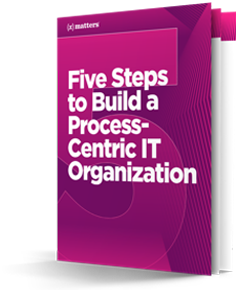 Read the white paper: 5 Steps to Build a Process-Centric IT Organization. xMatters uses closed-loop integrations to return data back into the originating system to prevent information from being locked in silos. xMatters drives forward your workflow and your processes, and uses the tools you prefer. By automating the right things, rather than everything, you can proactively prevent outages, manage incidents, and keep the appropriate people informed. The temptation to automate everything can be overwhelming, especially when many modern solutions market automation as the must-have feature that saves your enterprise millions. However, strategically automating the most appropriate systems is the best way forward. Read our new white paper, 5 Steps to Build a Process-Centric Organization, and learn how to automate smartly and effectively.